« From Duck Soup to Quark Soup: Is the LHC a Good Idea? The place of Tibetan singing bowls in 21st century physics. We all know what a Quantum Leap is. It’s a major step, a big burst of energy – isn’t it? No, actually, it’s not. A quantum leap spans virtually the smallest distance imaginable, using the smallest possible measure of energy. The remarkable thing about a quantum leap is that it involves a particle transferring from one place to another without ever being at any point in between – or so it’s generally believed. A slightly different light is shed on this, though, by two practical demonstrations. One is a simple experiment first conducted over 100 years ago and repeated countless times since then. The other is a ‘technology’ that’s been around for thousands of years. It’s clear from these two closely-linked case studies that the transition is continuous, not the step change that’s described in science texts. It’s also clear that, far from being made of solid durable ‘particles’, every material object in the universe is formed from constantly-moving ever-changing energy flows. The very nature of material particles is as ephemeral as clouds in the sky. ‘Quantum Leap’ must be the most common scientific phrase in popular use today. The term is synonymous with a massive stride, a great burst of energy. In fact a true quantum leap is neither of those things. It’s the movement of an electron from one atomic orbit to another – just a fraction of the width of that atom. In making that move the electron will absorb or release a single photon, or ‘packet’ of energy, typically in the form of light – and there’s no smaller amount of energy than a single photon. 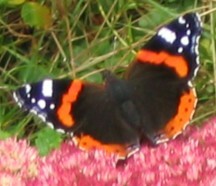 The simple act of viewing a flower or a butterfly (or anything else) involves countless quantum leaps in your eye! No, the thing that makes a quantum leap so special is the idea that that electron disappears from one orbit and reappears in the other without having apparently been anywhere in between in the meantime: now I’m here, now I’m there. Ok, so the distance is pretty small. But it’s still a neat trick, to be here one instant and somewhere else the next without having to travel across the gap. So how’s it done – and more to the point, is it done? First a brief intro to a simple scientific experiment. Don’t go away, it’s pretty easy to follow and the conclusion is quite astounding. Light from a single source passes through two slits in a card to land on a screen on the other side of the card. The resulting pattern of light and dark bars on the screen tells us that every photon of light passes through both slits at the same time. This effect is down to the wave-like nature of light. Just as a wave in the sea can go both sides of the posts supporting Brighton (or Cleethorpes) Pier, a light wave can go both sides of the strip of card between those two slits. Both parts of the wave spread out once they’re through the slits. Like waves on the sea, at some places where they meet again we get an extra high peak and at other places they cancel each other out. This gives alternate bright and dark stripes on the screen. Oh, Those Two-Timing Photons ! So what does this tell us about the quantum leap? Basically it tells us it’s a process, not a step. In the lab a photon ‘hit’ is registered by an electron shifting orbit in a detector on the screen. If the waves cancel each other at some point on that screen, it’s because one’s a peak and one’s a trough – they’ve travelled slightly different distances. So they’ll get there at two slightly different times. The second wave to arrive clearly interrupts an orbital-shift process that’s already underway with the first wave and cancels that process. Has to be that way – otherwise what’s that first wave doing in the meantime?? If there’s no second wave, or if that wave’s in sync, the process completes, no problem. So how does that work … ? A useful clue comes from, of all places, the Tibetan singing bowl. The orbits of electrons around atoms follow patterns known as Spherical Harmonics – exactly the same patterns as those for the notes produced by Tibetan singing bowls. 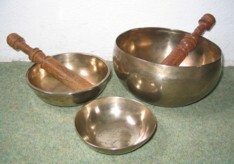 Electrons have a number of possible harmonics, a good singing bowl has at least three producing three different tones. To get a note from a singing bowl you run a wooden baton around the rim of the bowl until it starts sounding its lowest tone. Continue with the baton, and after a time a new note of higher pitch will be heard in the background. Gradually that new note will get stronger and the first note will fade, until eventually only that higher-pitch note can be heard, clear and resonant. Now back to the quantum leap (noting on the way that what we don’t get from a singing bowl is a sudden leap from one spherical harmonic to another). So where is that electron between the times that each of the two waves hit that screen? To grasp the answer to this, we have to let go of the idea of an electron being a particle and see it instead as an energy pattern wrapping around the atom. The lower orbit is one closed energy loop, the higher orbit is another. In this ‘limbo’ state its situation is unstable; if the wave helping it along this spiral is cancelled by an out-of-sync second wave, it’ll fall back to its former lower-energy orbit. But if the follow-up wave is in sync it’ll reinforce that upward spiral, making that orbit-shift even more certain. The take-home message from this scenario is both simple and world-changing. The only realistic option is that electrons can exist in a state that isn’t a particle – and are doing so all the time, since the quantum leap is by far the most frequent event in the whole universe. Our world of solid objects gives way to one of constantly-flowing energies that come together from time to time to give an illusion of material structures. Visionary physicist David Bohm, Nobel nominee and originator of the Holographic Universe concept, observed that our object-based language limits our ability even to think in terms of flowing dynamic processes. But the universe is a flowing dynamic process. Until we can shift that fixed mindset and see things as they really are, a whole lot of scientific doors won’t be closed to us – they’ll be wide open, but we won’t even see them. One could be the door to a very different future from what we see facing us now. If you’d like to be informed about future posts: subscribe (free). This entry was posted on Monday, July 26th, 2010 at 8:23 am	and is filed under Uncategorized. You can follow any responses to this entry through the RSS 2.0 feed. You can leave a response, or trackback from your own site. Great article. You say that the universe IS a flowing dynamic process, this makes sense. However, another part of the problem with science and the way the human mind observes is that we all to often are trying to narrow everything down to one thing. Personally, I like to see things simply. But, it seems that the universe is dynamic, yet also static… could there be a duality at play? Perhaps it is in making this non-dual in the way that we observe that opens doors? Absolutely, Boz! We have to see the inherent stability in material structures – and at the same time recognise that this stability is sustained by continuous energy-flows that create those structures and shift them from one form to another. We have to see, and work with, the particles. But if we don’t also see the true nature of those particles, we limit our ability to work with what’s around us – ultimately, to fashion our own future – through informed and sensible application of scientific principles. Understanding that duality is totally key to this process. correspond to the number of opposed faces of the series of platonic solid shapes – 14 for the icosahedron, 10 for the dodecahedron, 6 for the cube, and 2 for the line, if you can call that a solid. Interesting that the tetrahedron is left out, as it has no opposed faces, and so are the square and the triangle; the line is included; but the point is not. My feeling is that both of these sequences are manifestations of a deeper pattern – the pattern of square numbers, also an arithmetic progression. The numbers you’ve given are the numbers in each sub-shell, which correspond to the different possible spherical harmonics in each shell as we move out from the nucleus – the larger the shell, the more harmonics that are possible. If we tot up the totals for successive shells we get: 2, 2+6=8, 8+10=18, 18+14=32. This is of course double the sequence of square numbers: 1, 4, 9, 16 etc – double because each orbit can have one spin-up and one spin-down electron. Given that the surface area of a sphere increases as the square of the radius (radius twice as much gives area 4 times as much etc) it’s not totally surprising that number of possible spherical orbits increases in a square pattern also. That square pattern also gives a steady increase in the difference between number of electrons in each shell – differences between successive square numbers increase by 2 each time. This is shown by the regular difference of 4 between your series of numbers. This doesn’t explain the platonic solid connection – but of course the links between music and geometry have been long known, and electron orbitals are unquestionably ‘the music of the spheres’ in microcosm (see link to singing bowls). Also surfaces of solids are a 2-dimensional thing, so a 2-dimensional pattern of increase – i.e. square numbers – fits (though I’m not offering that as a full explanation by any means). Enjoyed your piece. I quoted a bit of it on our energyawareness forum (and linked back to you here!) where it generated some debate. Putting the awareness of the essentially non-dual, shifting nature of ourselves and our world into practice in our everyday lives and relationships is for me the real challenge in all of this. How do I live effectively from a position of knowing that what I see is not necessarily how things are, or how a certain person is. How does the world look, if I deepen, or open my awareness to other ‘frequencies’ than those where the energies combine and coalesce into the ’solid and durable objects’ we’re so used to calling reality. It’s good to know that the line between physics and metaphysics is getting ever more blurred. I liken these energy flows to the ink from pens that are ‘drawing’ our physical reality – in myriad colours (frequencies) and in three dimensions. In fact, vapour trails from aircraft are a more apt metaphor in some ways, as the shape of reality is inherently dynamic, constantly moving on. [More on this at http://www.transfinitemind.com ]. This of course immediately raises the question “Who/what (if anyone/anything) is wielding those pens?” As you say, this is a metaphysical rather than a physical question, and is therefore a bit beyond the scope of this blog at our present level of understanding – I share the view held by many scientists that such as-yet unknown aspects of our reality are a proper area of study for science (sciens = ‘knowing’ in Latin). Experiments have shown that our consciousness influences the outcome of quantum events – Nobel laureate Wolfgang Pauli was himself quite certain of his own influence on scientific experiments, the well-documented ‘Pauli Effect’. We still have a long way to go in our understanding of such matters – but the evidence is accumulating. Grahame, I may have shown you this before, can’t remember: http://www.soulsofdistortion.nl/download/soda.pdf – see pp79-85 . As an explanation of the electron shells/platonic solids coincidence, I’m wondering afresh if it could work with/throw light on your idea of spherical harmonics. I’d never realised that the cumulative total follows square law – v gd. Are there more electron shells outside the ‘f’, or is that it? Thanks for the link, Manohar, I’ll check it out. Yes, there is another sub-shell. The whole setup is described pretty well at http://en.wikipedia.org/wiki/Electron_shell. Congratulations on your new blog Grahame!! Love it. Well I knew I would. The perfect balance of ‘new science’, humour & helpful info that people can relate to in their lives. PERFECT.